Full Features Calibrator is a precision instrument used either as a temperature indicator with input from RTD sensors and thermocouples or to calibrate other process instruments. 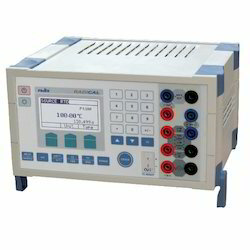 It can be used in any of 3 modes: measure, source or simultaneous, which combines the first two.IIt handles a wide range of process inputs - thermocouples, RTDs, mV and mA linear input and resistance (ohms).The calibrator's micro controller-based design incorporates a highly stable reference, a high-resolution Analog-to-Digital converter, switching circuitry and other specialized proprietary electronics. An LCD shows measured parameters in Celsius or Fahrenheit, peak and trough values and bar-graphs amongst other functions. RADICAL generates a 24V loop supply to power a 2-wire transmitter or similar instruments that lack their own power-source. When used as a calibrator in source mode, you may manually step up the signal to your instrument or set an automatic ramp function. Highly portable, RADICAL houses a powerful Lithium-ion rechargeable battery that keeps it functioning up to 14 hours on a single charge. The calibrator features auto-shutdown to conserve battery-life as well as visual alerts for low battery levels. Universal Portable Calibrator is a precision instrument used either as a temperature indicator with input from thermocouples and RTD sensors or a calibrator for other process instruments. It can be used in any of 3 modes: measure, source or simultaneous, which combines the first two. It handles a wide range of process inputs - RTDs, thermocouples, mV and mA linear input and resistance (ohms). Built of a microprocessor-based closed-loop design, the calibrator's programmed output is continuously compared to a highly stable reference and automatically corrected for errors. It achieves a very high accuracy with a possible error of only 0.02% of the full-scale value. Powered by a Ni-Cad battery, MICROCAL is extremely portable and lasts up to 8 hours of constant use on a single charge. It weighs a mere 1.5kg and takes a little less than 4000 cc of space. The calibrator directly displays thermocouple and RTD inputs in Celsius or Fahrenheit units. MICROCAL performs automatic or manual electronic cold-junction compensation for thermocouples to maintain a high-accuracy even in the case of thermocouples connected via extension wires. Full Features Calibrator is a precision instrument used either as a temperature indicator with input from RTD sensors and thermocouples or to calibrate other process instruments. 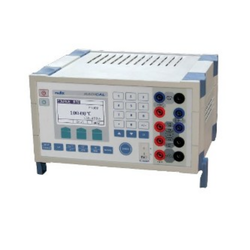 It handles a wide range of process inputs - RTDs, thermocouples, mV and mA linear input and resistance (ohms). The calibrator's micro controller-based design incorporates a highly stable reference, a high-resolution Analog-to-Digital converter, switching circuitry and other specialized proprietary electronics. An LCD shows measured parameters in Celsius or Fahrenheit, peak and trough values and bar-graphs amongst other functions. RADICAL generates a 24V loop supply to power a 2-wire transmitter or similar instruments that lack their own power-source. When used as a calibrator in source mode, you may manually step up the signal to your instrument or set an automatic ramp function. Highly portable, RADICAL houses a powerful Lithium-ion rechargeable battery that keeps it functioning up to 14 hours on a single charge. The calibrator features auto-shutdown to conserve battery-life as well as visual alerts for low battery levels. Microcal - Universal Portable Calibrator is a precision instrument used either as a temperature indicator with input from RTD sensors and thermocouples or a calibrator for other process instruments. It can be used in any of 3 modes: measure, source or simultaneous, which combines the first two.It handles a wide range of process inputs - RTDs, thermocouples, mV and mA linear input and resistance (ohms). Built of a microprocessor-based closed-loop design, the calibrator's programmed output is continuously compared to a highly stable reference and automatically corrected for errors. It achieves a very high accuracy with a possible error of only 0.02% of the full-scale value. Powered by a Ni-Cad battery, MICROCAL is extremely portable and lasts up to 8 hours of constant use on a single charge. It weighs a mere 1.5 kg and takes a little less than 4000 cc of space. The calibrator directly displays thermocouple and RTD inputs in Celsius or Fahrenheit units. MICROCAL performs automatic or manual electronic cold-junction compensation for thermocouples to maintain a high-accuracy even in the case of thermocouples connected via extension wires. Universal Portable Calibrator is a precision instrument used either as a temperature indicator with input from RTD sensors and thermocouples or a calibrator for other process instruments. It can be used in any of 3 modes: measure, source or simultaneous, which combines the first two. It handles a wide range of process inputs - RTDs, thermocouples, mV and mA linear input and resistance (ohms). Built of a microprocessor-based closed-loop design, the calibrator's programmed output is continuously compared to a highly stable reference and automatically corrected for errors. It achieves a very high accuracy with a possible error of only 0.02% of the full-scale value. Powered by a Ni-Cad battery, MICROCAL is extremely portable and lasts up to 8 hours of constant use on a single charge. It weighs a mere 1.5 kg and takes a little less than 4000 cc of space. 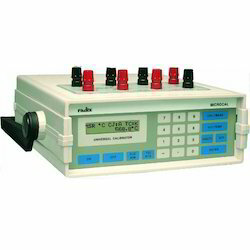 The calibrator directly displays thermocouple and RTD inputs in Celsius or Fahrenheit units. MICROCAL performs automatic or manual electronic cold-junction compensation for thermocouples to maintain a high-accuracy even in the case of thermocouples connected via extension wires. Looking for Portable Calibrators ?